VR Track's Project Manager, Tero Heino. VR Track Oy, a member of the Tampere Tramway Alliance, has chosen Escarmat as its partner for cabinet manufacture. The co-operation covers the control cabinets to be erected at the stops along the tramline as well as the control cabinets for heating the rail switches. VR Track has ordered a total of 34 switchboard automation cabinets from Escarmat that will be used for Section 1 of the Tampere tramway line connecting the suburb of Pyynikki with Tampere University Hospital, passing through the city center on the way. Section 1 will also include a branch line from Kaleva to Hervanta, where a tram depot will be built as well. In practice, the cabinets built in the vicinity of the tramway stops will handle the power supply for the entire stop area, with one cabinet covering the electricity needs for one pair of tramway stops. In addition, space has been reserved in the tramway stop cabinets for the city’s telecommunications equipment that will be handling the operation of the passenger info boards. During the winter, the switch heating cabinets will, in turn, handle the unfreezing of the rail switches and the run-off drainage. Section 1, covering over 15 km, is scheduled to open up for commercial traffic in May 2021. 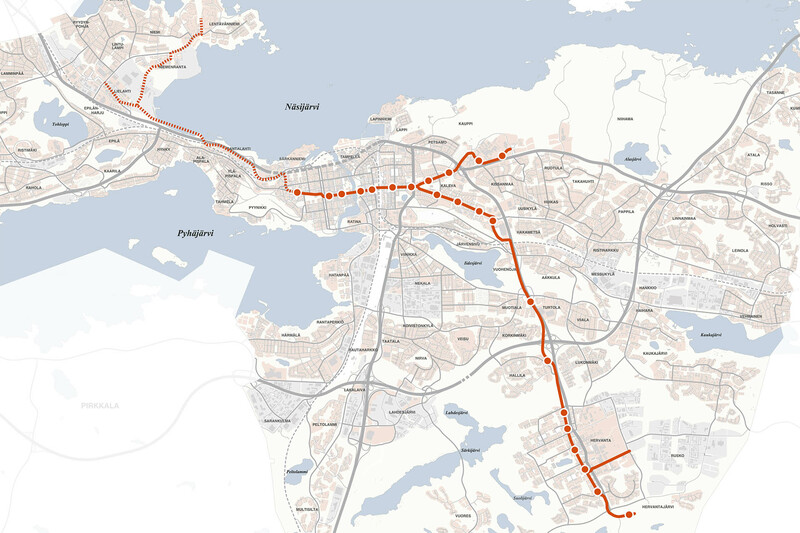 Immediately after completing the first part of the project, Tampere Tramway Alliance is planning to begin construction on the second part, Section 2, in the direction of West Tampere. This section is due to be finished in 2024. The tramway in Tampere will be implemented using an alliance model, in which the city will purchase the design, implementation and associated project management for the tramway from a group of several companies. The Tampere Tramway Alliance is formed of the service supplier partners VR Track Oy, Pöyry Finland Oy, and YIT Rakennus Oy as well as the client parties – the City of Tampere and Tampereen Raitiotie Oy. According to Tero Heino, VR Track’s Project Manager, the alliance model is the most sensible way to implement large initiatives such as a tramway project. – In practice, companies participating in the alliance are joining forces and working on the tramway project in co-operation. All alliance parties have specific roles and a common goal. According to Heino, the alliance bidding process is also an exceptional operating model in the sense that money isn’t even discussed before the bidding is over. – The alliance model emphasizes co-operation and many other non-commercial issues. Of course, we also have to take into account the alliance’s ability to convince the client of its cost-effective operation, i.e. how well the alliance is able to generate value for money. 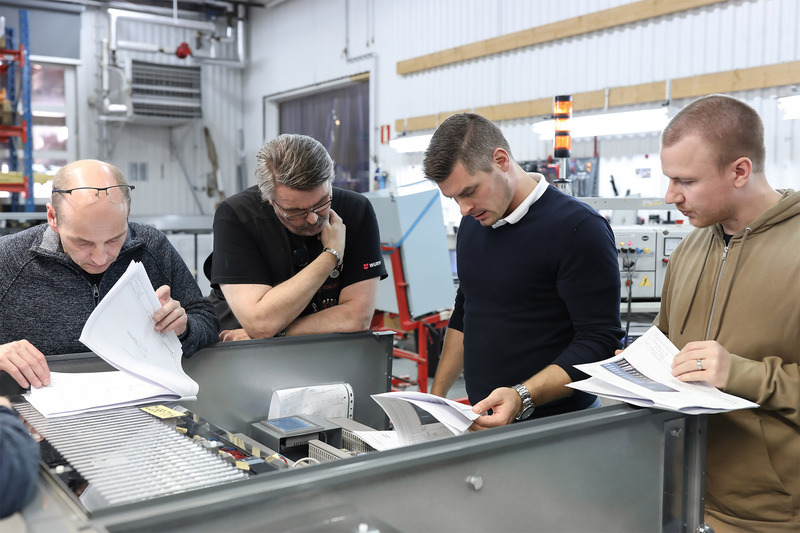 Escarmat’s Design Manager Mikael Mäkinen and Inspector Jorma Perälä, as well as Tramway Alliance’s Tero Heino and Sebastian Nousiainen are inspecting the first completed tramway stop cabinet. Heino supervises the construction of the technical systems for Tampere’s Tramway Alliance. His responsibilities include, among other things, high voltage construction, i.e. switchgear heating and power supply meant for the tramway stops. In addition, Heino’s responsibilities include the tramway grounding system, the control and safety equipment for the line, and the tram’s own telecommunications network. – We function largely in line with the same principles that were present in the Tramway Alliance’s bidding process. We do not have to go for the cheapest, but the choice must be based on something. Ultimately, keeping to the schedule and a supplier’s willingness to provide service play a large part in the final cost of a project. For example, in terms of Escarmat, was neither chose the cheapest nor the most expensive cabinet manufacturer. – We chose the partner that seemed to be the most capable of cooperation while offering the most competitive price. Escarmat’s flexibility and the ability to identify a customer’s needs were clearly visible during the bidding stage. – For example, when we asked the bidders to update their prices or the assembly images for the cabinets, Escarmat made sure that their offer and images had reached us exactly when we needed them. Their punctuality convinced us even before the start of our co-operation that they are serious about trying to serve the customer and that they can be relied upon as a partner. Our co-operation has also been working well after the selection was made. The Tramway Alliance has asked for all kind of modifications to the cabinets that were ordered, and these changes have been handled really well. – In the case of such a large and, in many ways, new project for all the parties, you can be certain that not everything will always follow the original script. When that happens, we simply need to have a good attitude and Escarmat will certainly have that. Tampere Tramway: To meet the needs of the growing city and urban area, a modern tramway system has been designed for Tampere. The key goals of the tramway system include making the everyday life and transportation easier in the municipality, supporting the growth and development of the urban area, and increasing the appeal of the city.